From the creator of ARCHIE THE DAREDEVIL PENGUIN comes the unique story of two friends who can't escape all the feels. Camper is happy as a clam and Clam is a happy camper. When you live in The Happy Book, the world is full of daisies and sunshine and friendship cakes . . . until your best friend eats the whole cake and doesn't save you one bite. Moving from happiness to sadness and everything in between, Camper and Clam have a hard time finding their way back to happy. But maybe happy isn't the goal--being a good friend is about supporting each other and feeling all the feels together. 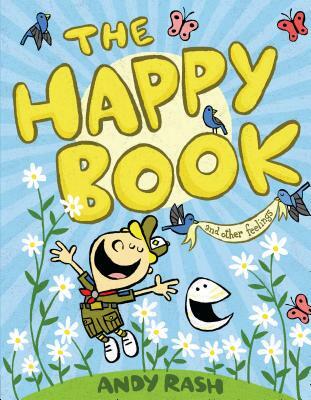 At once funny and thoughtful, The Happy Book supports social-emotional learning. It's a book to keep young readers company no matter how they're feeling! Andy Rash was born on a mountain top in Tennessee, educated in the swamps of Georgia and the canyons of New York, and lives with his family in Milwaukee. He has illustrated for The New York Times, The Wall Street Journal, Time, Entertainment Weekly, and The New Yorker. He writes and illustrates children's books like Archie the Daredevil Penguin (Viking, 2015).